I don’t often gets compliments from my daughters. In fact, they never have anything nice to say about my cloths, make-up, hair or shoes, earrings or anything else to do with my physical being. So when Ali asked me what kind of perfume I was wearing it was with caution and skepticism that I asked “why?”. And It was with shock and wonder when she replied “cause you smell really good!” Say what? A compliment? That was all I needed to hear. I then expounded upon how I just bought it, and I loved it too and would she like to use some, blah, blah, blah. I was like a little puppy in a pet store jumping up and down and saying “choose me, choose me, I smell so good”. I was so dang happy to have done something right in the fashion field and get a little compliment, even if it was only on my aroma. When she asked me what it was called, I eagerly told her. “It is called Creed, its from the famed Creed perfume dynasty and has been around since the late 1700′s.” She looked at me funny and said “you are wearing a perfume named after the worst band in rock history, eww this is just sad.” Bummer, I don’t think she heard the part about it being around since the 1700′s , which I am sure pre-dated the rock band Creed and in fact all of rock history. I went from aromatic princess to Pepe Le Pew in 2 seconds flat. I was so close, but wait, maybe I am about to be redeemed. Later that night, after dousing herself in my $265.00 bottle of perfume, her guy friend came over to pick her up and took one wiff and it was all over for her. “Hey Ali, are you wearing Creed?” At last a friend with class. Ali said “yes” and owned up to the fact that it was mine and the very cool guy friend said ” Oh, I’d much rather be hanging out with your mom”. Oh yea baby, who’s smelling good now? Who’s your mama? Maybe you want to smell good too! Granted I do wear the men’s fragrance Vetiver but if you read on you will see that it is equally refreshing for both men and women. Creed is the worlds only fragrance dynasty, the business was started in 1760 and passed from generations to generations since then. It has already served 11 royal houses and the public. In the twentieth century, Creed still remained to be the most popular brand with the celebrities and aristocrats, in the Hollywood, when many stars specially made their own personal fragrances through them. At present the company is led by sixth-generation of Creed’s. Characteristics: Green, with a kiss of Mediterranean citrus and spice, Original Vetiver is a warm, sensual, original fragrance evoking the lingering sunshine and relaxed sophistication of summers in the South of France. 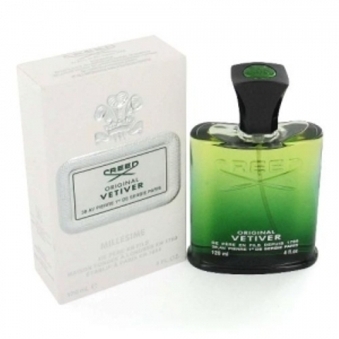 A “universal” scent, Original Vetiver is equally alluring on either women or men.